Prominent & Leading Wholesale Trader from Pune, we offer traffic signal body ( 300 mm). Within a short span of time, we are indulged in manufacturing and supplying an outstanding quality Traffic Signal Body for our esteemed clients. Offered product is widely used on roads for safety purposes and immensely appreciated by our clients for its robustness. This product is manufactured by utilizing high-grade raw materials and advanced machinery under the proper guidance of our industry experts. 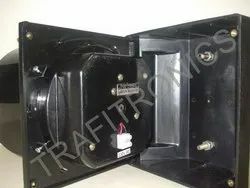 Available in different specifications, this Traffic Signal Body can be easily purchased from us within the stipulated time frame. Packaging Details: Product has packed in corrugated box, with Tapped Locking Strip, and Wrapped by water clear Plastic. Looking for TRAFFIC SIGNAL BODY ?